Happy 2015! I hope everyone had a wonderful, safe Holiday season! Upon our return home, we were immersed in preparing for our move to Seattle. Fortunately, we didn’t need to pack and load up our things, but we still made an effort to go through everything before our movers arrived and donate several car loads to Goodwill. We traveled to northern Minnesota for Christmas. My mom and I prepared our annual Christmas Eve appetizer spread and we spent a lot of time visiting with family and friends. Shortly after Christmas, we headed back to Minneapolis for my cousin Rachel’s wedding. The following week, our packers and movers boxed up our apartment and loaded everything, along with my car, onto a truck. We checked out of our apartment and flew to Seattle on New Year’s Eve. The last month and a half, as you can see, has been quite the whirlwind. While I haven’t minded our crazy schedule, being out of our normal routine has been a little challenging. Being on-the-go means eating on-the-go and visiting restaurants more than I’d like. Then add in my indulging over the Holiday season and in Europe (mmm.. gelato, pasta, wine! ); I was more than excited to get back on track. As soon as we checked into our temporary apartment (we’re in corporate housing until our things arrive), we stocked up on healthy groceries and quickly returned to cooking lighter meals. 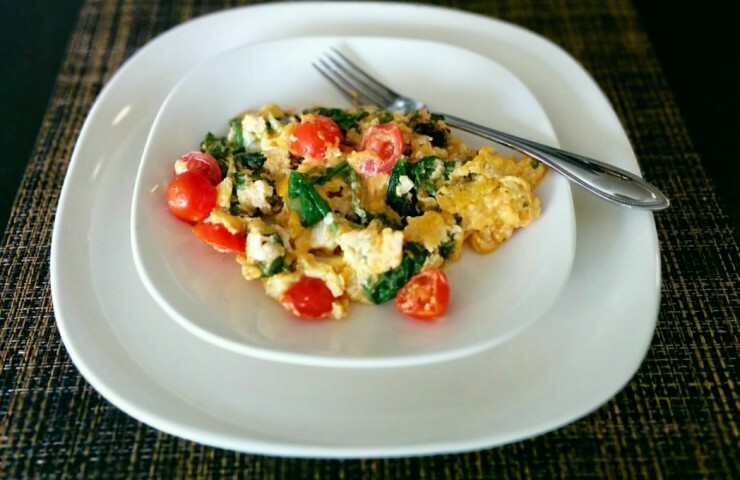 I recently made up this egg scramble for lunch, but it would be great for any meal of the day. I added a bunch of greens and tomatoes because I had them on hand, but feel free to add in or substitute other vegetables as well. 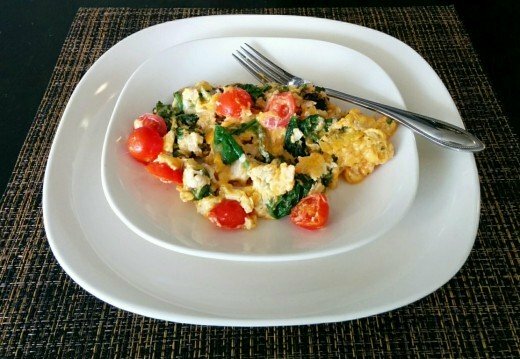 To make this easy egg scramble, heat butter in a large skillet over medium-low heat. Add in two large handfuls of greens. You can use spinach, kale, a mix of greens, whatever you have on hand and prefer. Let the greens heat up and start to wilt. They will slowly begin to decrease in volume. Toss in diced tomatoes and cook for about two minutes, until the tomatoes are somewhat soft and the greens are mostly wilted. In a small bowl, whisk the eggs together, then slowly pour on top of the greens and tomatoes. Gently mix together. As the eggs begin to set, add in a small handful of shredded cheddar cheese. Use a spatula to fold the eggs and distribute the cheese. Cook until the eggs are fully cooked; they should be light and fluffy. Season with salt and pepper to taste. Transfer the scramble to a plate and enjoy immediately! Do you have any go-to healthy, clean recipes you use when trying to get back on track? Share below in the comments! Heat butter in a large skillet over medium-low heat. Once the greens begin to wilt, add tomatoes and cook for about 2 minutes, until tomatoes are soft and greens are mostly wilted. In a small bowl, whisk eggs, then pour into skillet. Once the eggs begin to set, add the cheese and continue cooking and gently mixing until the eggs are fully cooked. Transfer scramble to a plate and enjoy!